Still not running. I am pretty depressed because the tibial pain is not even improving since last Sunday, regardless of my continuous attention (Ice + Voltaren / Celebrex ). If the things do not turn around quickly, I will have to close the season early (races are only until end April, after that is too hot for any hard effort). A real pity. to go back to giving more details about running in Dongguan, here a good view of the primary school track in Dongguan where I make my track workouts. I like running there because it is quiet, sometimes a bit of breeze, secluded from the noise of the main roads. It is only a short jog from my home, so really a hidden "jewel" in this harsh environment. Usually all the school track in China are closed to "externals" but this seems to follow a particular admission schemes: from sunrise to 7.15am, the security let in some "selected" guests. 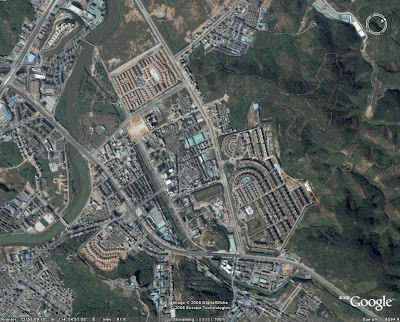 Allowed: myself, some elders who use the track as walking path, some people living in the neighborhood. Rejected at the gate: youngsters and anyone looking like a worker from the nearby factories. The catch is that the track is only 300m long, so a bit painful on the ankles for longer intervals. Because of the curfew at 7.15am, the available time is not too much, from 20/30 minutes in winter to 60/70 in Summer, but I can not complain ... I would not have probably resumed running back in 2005 if I hadn't discovered this track to have at least a decent , safe place to run in Dongguan. 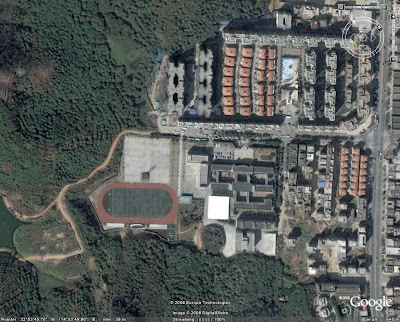 For a better view of how ugly is Dongguan, I post a good aerial view of my usual training loop. Usual = the only place where I found possible to run without being chased by dogs, smashed by car and/or breath the exhaust fumes of trucks along major roads. So I run around this kind of "bullet shaped" loop that runs for exactly 4k around some residential estate, hospital, town hall. My record is to make a long run on this loop, a good 6 laps plus A/R from home. A acute bout of shin splints hit my left leg last Tuesday morning. it is very strange because it hit very suddenly, not even during or after a hard workout. The recommended therapy seems 2 weeks or more of rest (+icing, Ibuprufen, etc) ... a real disaster in this moment of the season. total 133km in 9 runs (2 easy doubles on the treadmill). The "monster" mileage went better than 2 weeks before. At the end of the week I was still reasonably fresh. - Sun 5.30AM Long Run 35km(22Miles...) : I am really pushing the long runs in these days... Maybe even too much. First 15km at around 145/150bpm, pace 4'05", than 4k+4k+3k @MP around 3'40"-3'45"/k (slightly less than 6'/Mile), with 2km easy run as recovery. The MP sections felt very "easy", the HR was right in the mid 160s zone (my marathon HR should be around 167bpm), so I was quite comfortable. At the end, I added also a KM fast on the local track, and I was still able to run in 3'18", so legs were still responding good. Gebre does not want to run the Olympic Marathon because of pollution. Maybe there is also something behind it (I guess running in Berlin again for a new WR and much $). 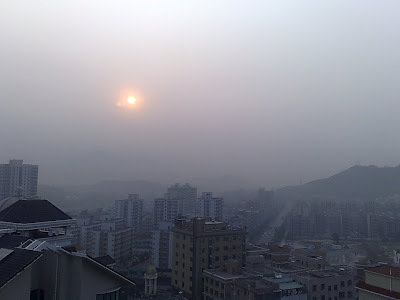 Anyway the air in many urban areas in China is really a crap and "my" Dongguan is maybe one of the worst, because of the large number of factories and too many trucks. The thick layer of smog, mixed with the humidity of the air reduce the visibility to maybe less than 2km!! I accept suggestions about how to use them ... luckily I have a track close to home. I can not wait to try them on the track !! but it was at the same time also very sour to lose out for the victory for few steps after a breathless long sprint (see picture taken maybe 100m from the finish line). A consolation was to win the "Masters" category and also the Team Race, but losing out for so little was pretty painful, especially on my "home course" (most of my runs in HK are done on the same cycle track used for the race). For some unknown reason, the top 4 runners in Hk were absent from this classical race that attracts a large starting field and marks also the end of the "cooler" season (we raced anyway at 17C, 80% Rh). Their absence paved the way for a very close race among many "2nd tier" runners. The race started out very fast, we passed the 1k in 3'15" and very soon we were a trio leading while the course contoured the ShingMun river on a mostly flat cycle path. Unfortunately, in HK, 99% of the races are NOT on closed road, so you must always watch out for pedestrian, bikes or dogs. Luckily it was still pretty quiet in early morning, so we could run quite smooth and hit the turnaround point at 5k in 16'45". I do not know what to think about this dramatic improvement of PB in such a short time. I actually did some hill charges and also some faster pace workouts, but I think it is mainly due to dropping the Orthotics and having stronger feet, with a better push on the ground. This morning was supposed to be my "tune-up" workout before next Sunday's 10K race, but it did not go very well. I am obviously still recovering from the "silly" Mileage of last week and the legs were heavy. On the same track, one week ago I was running "easy" at 3'12"/k pace ... today was a bit different. Planned: 3 x 1500m @LT effort (3'32"), with 2' recovery jog + 2x1000m @3'20" with 2' jog + 5x200m strides in 36', with 1' recovery jog. Actual: the 1500s felt already very hard, I hit the pace, but it was unreasonably hard. The Polar HRM was not working well, so I do not know if the HR was also too high or what. the 1000m were completely off-mark: I hit 3'22" and 3'24" but it was very tiring. Diagnosis: take it all easy until Sunday and refrain from heavy mileage. Sleep more (also tonight I maybe slept no more than 5 hours). I was given this pic only days ago, and it refers to the local Corporate Games Race of last December. Just to remark that, running in China, I do not go unnoticed.... (luckily I also have black hairs...). More seriously, last week log "scored" a 134 Km (84 Miles), that is my lifetime "PB" and basically a "times 3" compared to what I was usually running in the past... it was a quiet week for the work (too quiet), so I guess that I will very likely retrace back into the 100-110km very soon. I try to sustain a higher mileage for the 2 months left until the rest of the local season to see how my body reacts and if it can be sustainable also in my next marathon attempt. I closed the week with a Long Run of 28km at a real good pace.